As frequent readers may recall, I have a post here entitled, “The Illusive Dover Dress Debunked.” Wherein I was determined to set the record straight from badly interpreted secondary source material using the primary source. I have created what I think is the look portrayed in the silk fragment. At least the start, anyway. Let’s review. Yes, it’s a very simple style to emulate. I often wonder if Elizabethan personae come to my page and sneer at my untailored, baggy linen glory. 😉 However, lets see if we can break this down and determine what we’re looking at, and how I did. 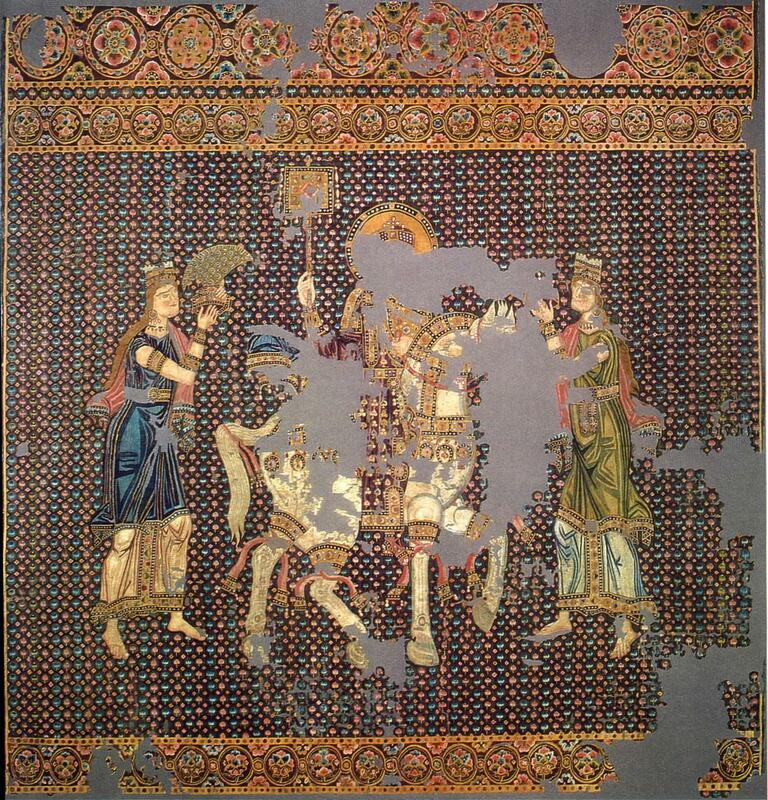 First, the women portrayed in the tapestry are both Tyche, the goddess of fortune and prosperity, taking on the shape of the Blue and Green Demoi, the two main political associations in the Eastern Roman Empire. 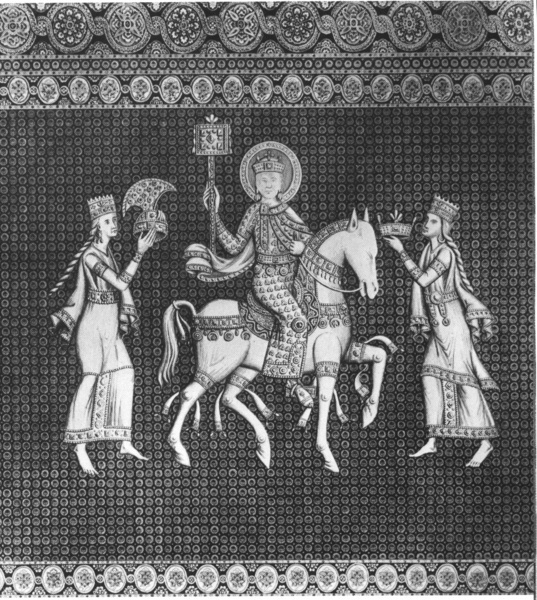 They are supporting a figure that seems to be Emperor John I Tzimiskes on his triumph over Bulgaria in the late 10th Century. The women are first and foremost, deities. 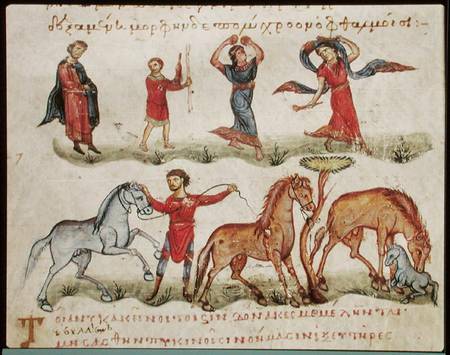 Even though the Byzantines were extremely pious Orthodox Christians, they were proud of their Hellenistic and Roman roots, and often displayed images from classical mythology and literature as part of their way to connect themselves to the splendor of the ancient empires. Another odd observation is that they have bare arms and appear to be wearing cuffs of some sort. This boggles me. The Blue is wearing a tunica that appears to be almost-flesh colored, but the Green, in her minty green tunica, definitely has bare arms. What I have determined off the cuff (*rimshot*) is that this is another classical throwback, or, the weaver really screwed up. Screwing up is period, we see it all the time, which would make some sense. I don’t understand the placement of the cuffs on the arm when they look like trim that matches the garments. If you’ve ever worn a wide cuff on the upper arm, you know how uncomfortable they can be. However, to me, the dead giveaway that this was an error is if you look at the woven pattern on the wrists of both demoi, you see that the trim matches that of their tunicae. Jewelry wouldn’t match embroidery, and their headwear doesn’t match their dresses, and they’re both different. I suppose the only way to really tell is to see the textile in person, which will probably never happen unless I get to go frolic about cathedrals in Germany sometime soon. EDIT 5-21-14: I did find this small scan of a book about the textile, and it looks like there may be a touch of green left on her shoulder, so fading could also be a culprit. Of course, if this WAS intentional, my guess would be that the artist was trying to emulate the sleeveless fashions of the classical period. Or, they could be dancers. 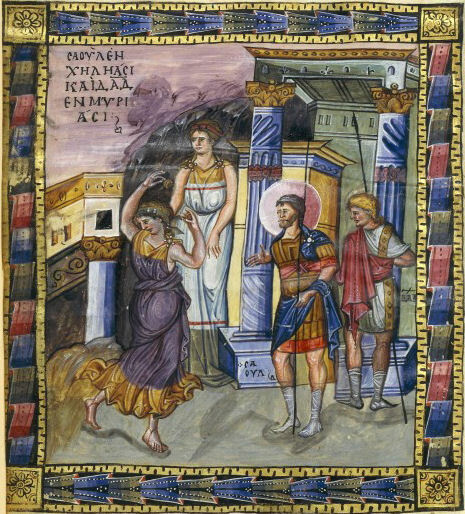 I’ve seen a great deal of sleeveless “Byzantine Dancer” interpretations in the SCA and other re-creation groups around on the web, but I did find this image from the Paris Psalter very quickly on Wikipedia with a fast search. This also dates to the 10th Century and has connections to Basil II/John I Tzimiskes period as the textile. These women are definitely dancers, and the painted style of this is most interesting in the layering of the colors. They are definitely wearing what could be considered the classical stola on it’s own, and the men are wearing the clothing of Late Antiquity and do look more Western Roman rather than Byzantine. This is a curious piece to work from as far as clothing styles go. However, looking directly at the women, you can tell the dresses are one piece and woven or dyed into different colors, and the actively dancing woman is still wearing some sort of sandal on her feet, so she’s not totally barefoot like the demoi are. However, the sleeveless style is there for a dancer. This link that shows a modern woman reenactor gives a source as being in the Biblioteca Marciana, or the Library of St. Mark’s in Venice. I went to check it out on the Biblioteca Marciana digital library, but the back-end of their Java encoding is broken, and couldn’t view their manuscripts, not to mention the reference given is so vague, I’m unsure of which manuscript it’s actually in. 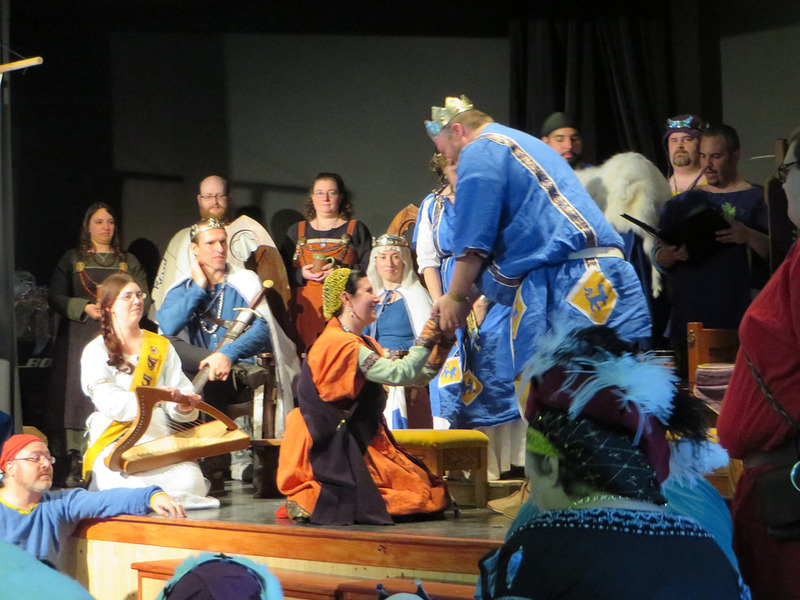 EDIT 5-21-2014: somebody on the SCA Garb Page on Facebook has found it for me, HURRAY! Those dancers may be similar, but the lack of ornamentation, and the weird flounces at the bottom of the skirt don’t mesh with the Tyches in the tapestry. My big red X over this hypothesis is that the job of a dancer in the Byzantine Empire was THE LOWEST OF THE LOW. They did have court dances, and ritual dances, but for entertainment purposes, especially the showing of the arms and legs? You’re a harlot. Plain and simple. This is seem all too well in the opinion Procopius had of the Empress Theodora in his “Secret History.” Granted, he was a bit of a gossiper, but she was portrayed as the absolute dregs of society before she was married to Justinian. This was not a wanted profession. Why would 2 images of a divine person be dressed as dancers? That sounds insulting to the goddess Tyche. It would be almost satirical in nature for the demoi (remember, political parties) to be dressed as such, but not in the way that the silk is portrayed. They’re supporting figures for a conquering emperor, and not there as jokes. For now, I will stick with the idea that the sleeveless-appearing Green Tyche was done in error on the weaver’s part, considering the Blue Tyche has the cream colored tunica. If it is an attempt at classical Roman revival, the stola should be to the floor, as the two layer look is strictly a Byzantine fashion style. 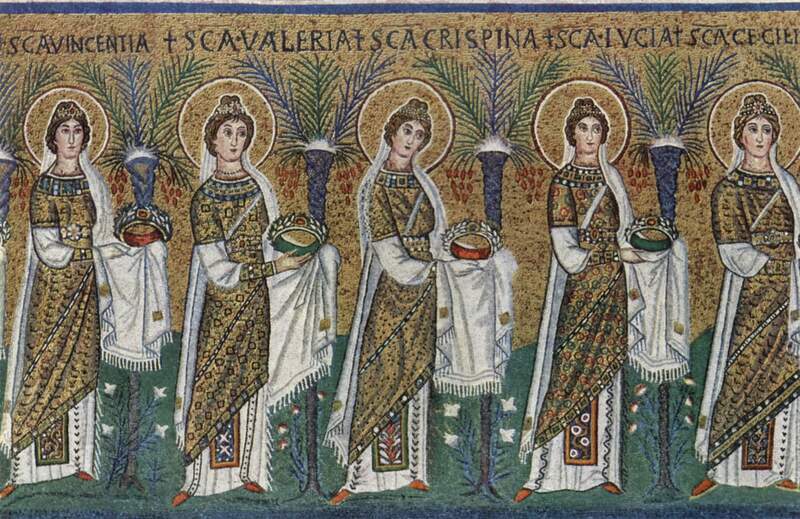 The weaver was emulating Byzantine fashion, not Roman. 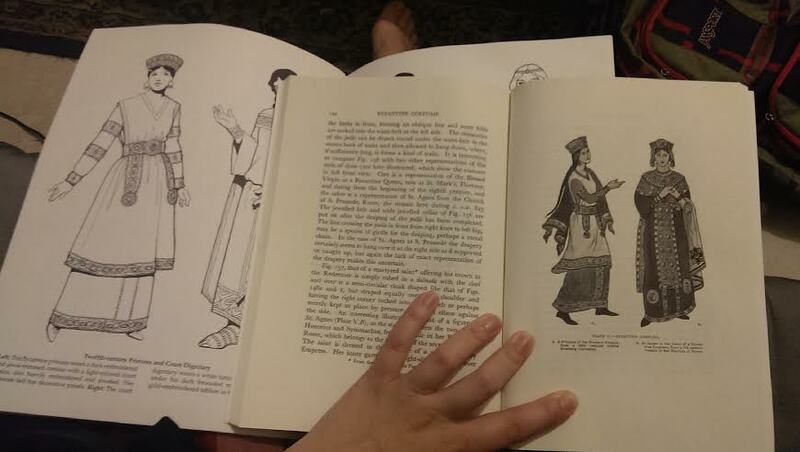 And here’s an action shot of me receiving my Maunche, which I was actually happy to see so I could see how the sleeve openings looked, and they look comparatively well against the original source material. There is no large gap as shown in the Dover artwork at the top, and the draping against my shoulders looks fantastic and flattering. If I would have left the fabric any wider, it would have been frumpy, and any smaller it would have been too tight. 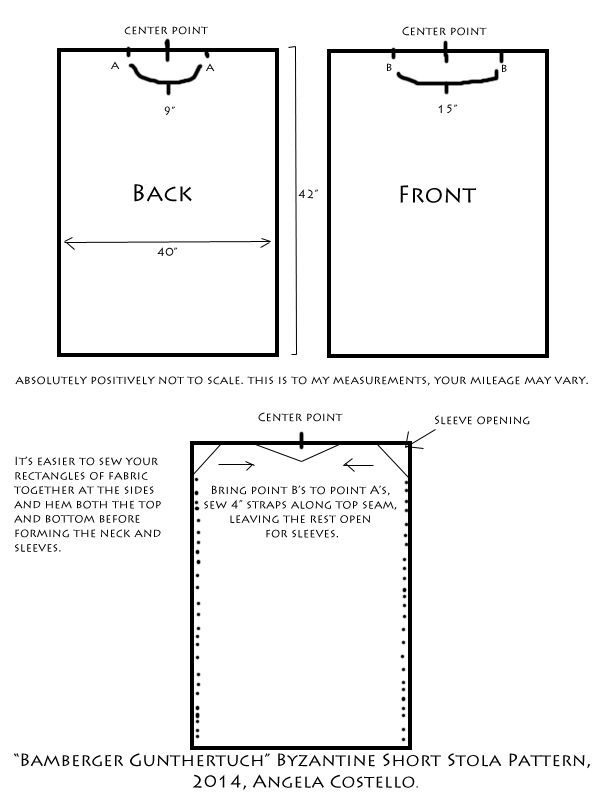 So 40″ wide is the magic number for me and stolas. Your mileage will vary depending on the person. It’s pretty much safe to say that this particular short stola was worn from the period of Justinian and Theodora in the 6th Century as seen in the Ravenna mosaics, and through the 10th Century as seen in the Bamberger Gunthertuch. From Ravenna: Possibly stolas, possibly tighter dalmaticae, the hems are tucked up, not cut on an angle. ‹ Previous…And they got me. do you know any undertakers you could ask? Because cutting fabric asymmetrically is a huge waste. If that was real samite, which is basically a metallic shot tapestry silk, that would be the equivalent of thousands of dollars hitting the floor. Even as ridiculous as the Eastern Roman court fashions were, I highly doubt they would do that. It’s just not practical. It was more about wearing more, than less, which is why delmatika just got more ostentatious over time. Go big, or go home. 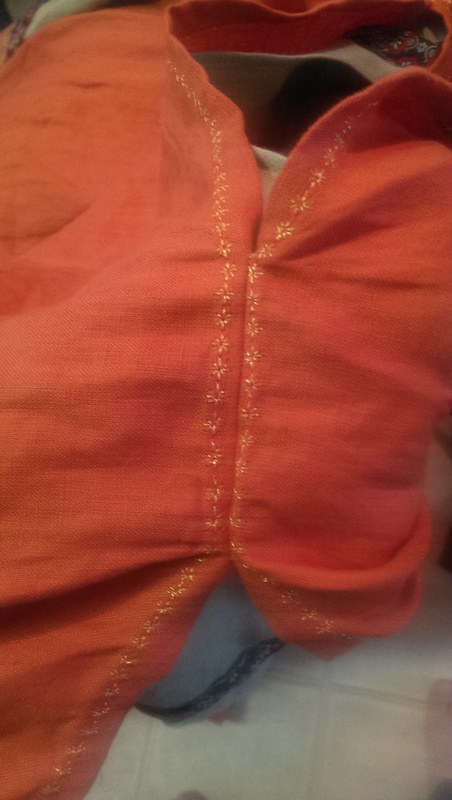 Also, if you look at the patterns on the fabric, you can see it appearing more draped, then cut. 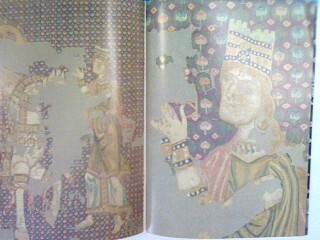 It’s also possible that it was used as an artistic license to show off the richly decorated kamision in the mosaic. I’m going to be exploring all the weird nuances like this come the fall, I have a stack of things I’m going to scrutinize and try to find answers. Excellent find! I had no idea about this! It certainly helps me think that it was something more than just a random style on the tapestry. I also like how she’s wearing a fakiolion (turban.) And it’s in Latin, not Greek, because Sicily. Super cool. I’ll have to look more into the date on this. Thanks! !